Christian Witness: New. Drs Angela and David Franks talk with people who work to build a culture of love and life rooted in the New Evangelization. Guest: Andy LaVallee on living out Catholic Social Teaching. We've Got To Talk: New. Fr Dan continues CatholicTV's longest running studio series. This week's topic- "Be Careful - Your Life is His Gift". Spotlight: Encore. The film fathers talk about documentaries in this episode of Spotlight, CatholicTV's movie review show. 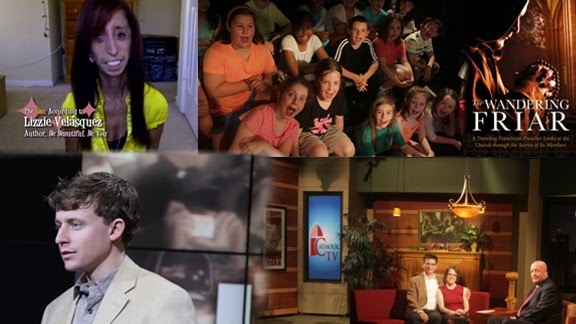 WOW: The CatholicTV Challenge: New. Father Robert Reed tests 3rd graders' knowledge in the 9th season of WOW. This week's "Wudabout": Anointing of the Sick. Tuesday 10/15- Father John Anglin, author of The Wandering Friar, in which he offers a positive picture of the Catholic Church through the lived experiences of its members. Friday 10/18- Monsignor Paul Tighe, Secretary of the Pontifical Council for Social Communications at the Vatican. The Gist: New. Rachel, Danielle, and Carolee host another great episode of The Gist. Our guest is Lizzie Velasquez, and the topic of the show is Bullying. This week- Love is a Choice from our friends at Salt+Light in Canada. This documentary tells the story of St Gianna Beretta Molla, patron saint of preborn children. Knights of Columbus Re-Dedication to Mary: The Re-Dedication to Mary took place in September as part of the KofC Year of Faith pilgrimage to the National Basilica. Watch: Fri 9:30pm, Sat 1pm.